When 17th century Japanese princess Shinanomiya Tsuneko took note of an afternoon storm in her diary one humid Kyoto summer, she could not have imagined her observations would one day help resolve a longstanding scientific conundrum. Statistical analysis of her journals has revealed a link between lightning strikes and the solar wind – proving that your teenage diary could contain good science, as well as bad poetry. Lightning has amazed and alarmed weather-watchers since time immemorial. So it may come as a surprise that we still have little idea what sets off one of nature’s most thrilling spectacles. Any school child will tell you lightning is caused by a difference in electrical charge. Up- and downdrafts cause molecules of air and water to bump against each other, exchanging electrons. When the potential difference is big enough, all those separated charges comes rushing back in one big torrent, superheating the air and turning it into glowing plasma – that’s what we call lightning. So far, so sensible. But there’s a problem. Air is an insulator – and a very good one at that. To get the current flowing, charged particles need some sort of bridge to travel across. And it’s this bridge that has vexed lightning scientists – fulminologists – for decades. The most prominent theory points the finger at cosmic rays – heavy, fast-moving particles that impact the Earth from space. Packing energy roughly equivalent to a fast-bowled cricket ball into one tiny atom-sized package, a cosmic ray can shred electrons from their nuclei with ease. The spectacular Northern Lights reveal the effect this can have on the atmosphere: columns of ionised air, perfect conductors for charges to travel along. Most cosmic rays originate in deep space, hurled at close to the speed of light from distant supernovae. The extreme heat of the sun’s surface also sends more than a few our way – the so-called ‘solar wind’ – but because these particles are more sluggish than galactic cosmic rays, researchers at first doubted they could have much effect on the atmosphere. Lightning’s time in the sun was yet to come. Anyone who has lived a year in Japan will be familiar with the country’s long, sultry summers – and its famously methodical Met Agency. It’s a good place to go looking for lightning. Inspired by some tantalising work out of the UK, Hiroko Miyahara and colleagues across Japan went sifting through their own Met data for patterns that might suggest a connection between solar weather and lightning strikes. They had their eye out for one pattern in particular – the 27-day cycle caused by the sun’s rotation. This is just short enough that the solar wind streaming from any given region of the sun is fairly constant, limiting the impact of solar variability on the data. It’s also short enough to fit comfortably within one season, which helped the authors compare apples with apples over long timespans. Armed with the appropriate controls, and a clever method they developed for counting lightning strikes that smooths over patchy observations, Miyahara and the team got stuck into the data for Japan circa 1989–2015. Early in 2017, in a paper published in Annales Geophysicae, they presented their results. The 27-day signal stood out to four standard deviations: a smoking-gun proof that solar weather and lightning strikes are connected. But how is the relatively sluggish solar wind able to influence lightning strikes? The key, according to Miyahara, is the effect the solar wind has on the Earth’s magnetic field – sometimes bolstering and sometimes weakening it, allowing the more potent galactic cosmic rays to wreak their mayhem. Of course, the 27-day cycle is only the shortest of the major solar cycles. It is well known that the intensity of the sun varies on an 11-year cycle, related to convection rates in the solar plasma. Less understood are the much longer centurial and millennial cycles. The sun passed through one such cycle between the late Middle Ages and now. The so-called Little Ice Age, coinciding with a phase of low sunspot activity known as the Maunder Minimum, precipitated agricultural collapse and even wars across the world – and solar physicists believe we may be due for another such minimum in the near future, if it hasn’t begun already. Understanding these cycles is a matter of no small importance. Unfortunately, pre-modern data is often scattered and unreliable, hampering investigations. A creative approach is called for – one that blends the disciplines of the human historian and the natural historian. And this is exactly what Miyahara and the team attempted next. Shinanomiya Tsuneko was born in Kyoto 1642 – just before the Maunder Minimum. A daughter of the Emperor, Shinanomiya became a much-respected lady of the Imperial Court, whose goings-on she meticulously recorded in one of the era’s great diaries. Luckily for Miyhara and his colleagues in the present day, Shinanomiya was also a lover of the weather, carefully noting her observations of all things meteorological – especially lightning. Shinanomiya’s diary is one of five Miyahara and the team consulted to build a continuous database of lightning activity covering an astonishing 100 years of Kyoto summers. 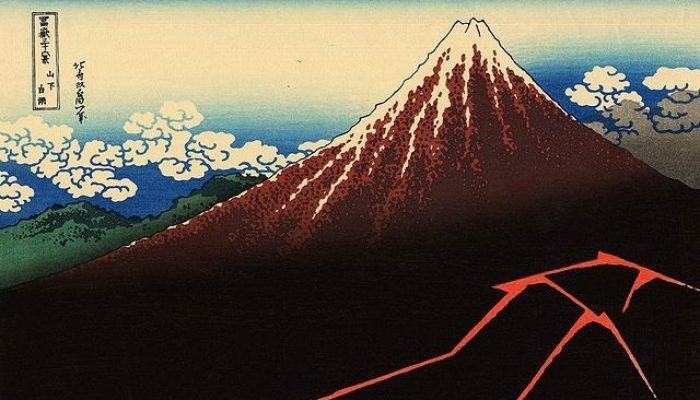 Priestly diaries, temple records, and the family annals of the Nijo clan were all cross-referenced to produce the data set, which preserves a fascinating slice of Earth weather during the sun’s last Grand Minimum. Analysis of this medieval data revealed the same 27-day cycle in lightning activity observed in more recent times – proof of the influence of the solar wind on lightning frequency. The strength of this signal proved to be greatest at the high points of the sun’s 11-year decadal sunspot cycle. 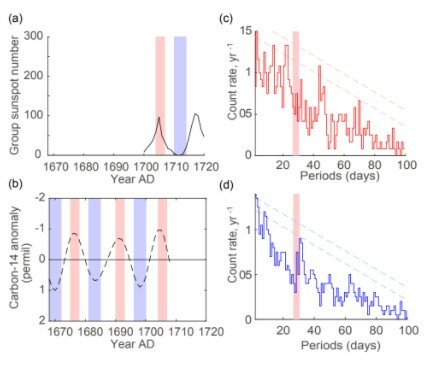 And the signal was almost completely absent between 1668 and 1715 – the era of the Maunder Minimum, when sunspot numbers are known to have collapsed. Put together, the data provide the strongest proof yet that solar weather can enhance – and diminish – the occurrence of lightning. Miyahara and the team now hope to expand their dataset beyond the period 1668 – 1767. With a little luck – and a lot of digging around in dusty old archives – it may be possible to build a record of lightning activity around Japan from before the Maunder Minimum all the way up to the present day. A record like this, covering a grand cycle of solar activity from minimum to maximum and, perhaps soon, back to a minimum again, would help us to calibrate the lightning record, providing a powerful new proxy for solar activity past and future. It may even help us to predict the famously unpredictable – lightning strikes injure or kill a mind-boggling 24,000 people a year. As for the rest of us, the work of Miyahara and his colleagues should prompt us to look up at the sky a little more often – and note down what we see. Who knows? Three hundred years from now, it could be your diary that sets off a climate revolution – though it may be best to edit out the embarrassing details first. Miyahara, H., Higuchi, C., Terasawa, T., Kataoka, R., Sato, M., and Takahashi, Y.: Solar 27-day rotational period detected in wide-area lightning activity in Japan, Ann. Geophys., 35, 583-588, https://doi.org/10.5194/angeo-35-583-2017, 2017a. Miyahara, H., Aono, Y., and Kataoka, R.: Searching for the 27-day solar rotational cycle in lightning events recorded in old diaries in Kyoto from the 17th to 18th century, Ann. Geophys., 35, 1195-1200, https://doi.org/10.5194/angeo-35-1195-2017, 2017b.